As someone who will often use the phrase "Welcome to the 21st Century!" when someone does something like using a cell phone for the first time, I often think about how frightening it was to be in old-time Phoenix when the century changed from the 1800s to the 1900s. 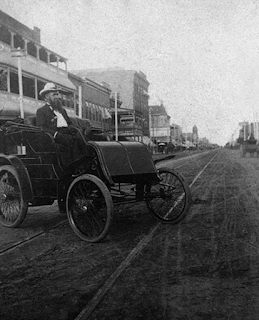 Let's time-travel back to Phoenix at the turn of the century. Now calm down here, you know that I love Phoenix, but it's never exactly been the first place for technology to happen. People were using electricity, and driving cars, long before any of that made its way out to Phoenix. But Phoenix has always had a tradition of embracing progressive thinking, so things caught on fast there. There would have been, of course, people who weren't too thrilled with the latest technology. I'm interested in what they would have had to say. The first thing that I think of is electricity. When it came to Phoenix, near the end of the 1800s, you have to realize that a lot of people could still remember the Civil War. Then, as now, people who are perfectly comfortable with a particular old style of technology can be reluctant to even consider using the new "tech". Before electricity, people used daylight, or fire, or gas (well, I guess that's fire), and it must have just looked absolutely crazy to see the center of town lit up with electricity. Speaking for myself, I would have stood pretty far back. Nobody knew! Turns out that it was a good technology, that didn't kill too many people, but what if there had been invisible radioactive rays? That caused cancer? Nobody knew! And "horseless carriages" must have been extremely hard to take. Nowadays we call them "cars" or even "automobiles" - but they were first called by a name that people could understand - a carriage without a horse. Now that had to be crazy to see for the first time! Of course there had been photos in newspapers and magazines for years, but the first one in Phoenix arrived in 1902. That's Dr. Swetnam up there posing proudly, at 2nd Avenue and Washington. Of course, Phoenix didn't just go from horses and bonfires to automobiles and electricity - that's not how new technologies work. There were steam locomotives, and gas lights, and just like today the technologies overlap. I know some people who have an old-fashioned phone that plugs into their wall, right now, as I write this! And there are people who read their news on paper "newspapers" even though they could get it on their cell phone, or tablet. So it isn't as if everybody just woke up one morning in Phoenix and switched from the old technology to the new one. Nothing much happened on January 1st, 1900, when the century turned. Just like nothing much happened on January 1st of 2000. I saw 2000, and I can imagine 1900. 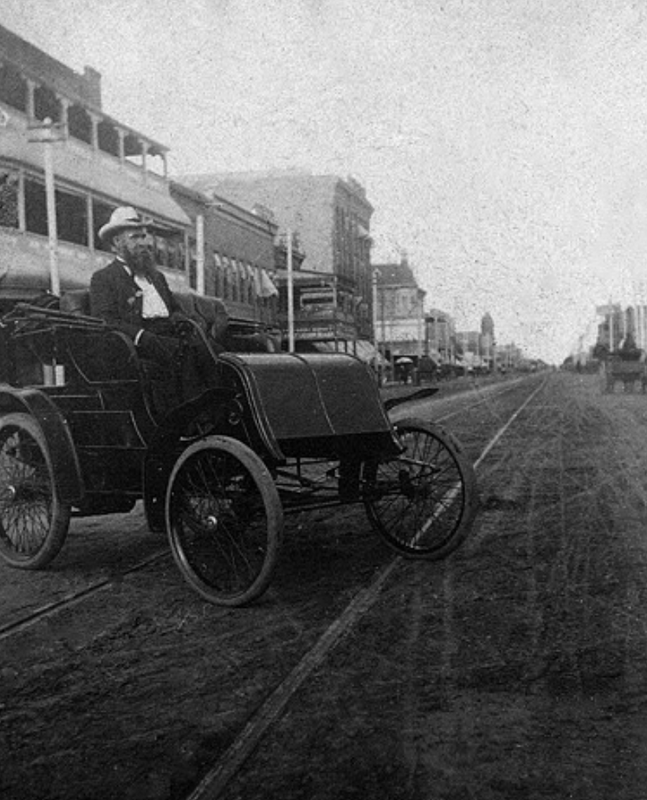 Image at the top of this post: the first car in Phoenix, Arizona, 1902. That's Dr. Swetnam, and you're at 2nd Avenue and Washington, looking east.